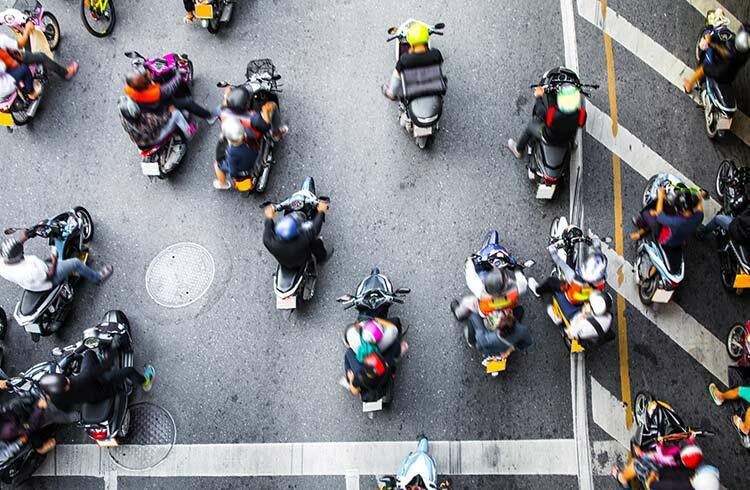 Motorbikes in Thailand - What Are the Rules? Thailand is a pretty safe place - if you're sensible. But a rented motorbike is the most common way to get into trouble. Why? People keep falling off them! If you want to drive a car or ride a motorcycle in Thailand, you'll need to have absolute nerves of steel to survive emotionally and physically. The country has an appalling road safety record and there are lots of accidents, despite numerous government safety initiatives over the years. You must have a license – one from home (best paired with an international driver's permit) – or you can get one in Thailand, and it has to be for the class of vehicle you're intending to hire. If you don't have a motorbike license back home, you don't magically acquire one by flying into Thailand. Thousands of visitors each year rent a motorbike and ride around Thailand totally unlicensed. It's illegal. What if you're stopped by police? Yes, you can usually pay the police officer off for a few dollars, not that we recommend that! But you should check out our guide to bribing police and find out the going rate for traffic offenses. The fact that the shop rented you the bike without asking for your license, doesn't mean you don't need one. It's not their responsibility if you don't check out the local law. Apart from the fact no one should be seen on a scooter with a sewing machine engine for propulsion – you still need a license; it's only in some European countries that licenses aren't required for under 50cc engines. Tens of thousands of visitors each year rent a motorcycle or scooter, ride around unlicensed and get away with it. It's illegal. Many travelers report ticking the motorcycle box on their International Driver's Permit. If the policeman who stops you isn‘t fooled, you'll pay a “fine“, after which he'll let you go on your merry way. This does not mean you are riding legally; you've just avoided the law by paying a bribe. You can keep on riding regardless, but what if you have a crash, and you need to call on your travel insurance? It's pretty straightforward; no valid license means you're riding illegally and you're not covered. If you tried that "everyone's doing it!" stuff on your mother, we're pretty sure she'd want to know if you were going to jump off a cliff if everyone else was doing it. So listen to your mother. If you don't have a valid license in the country where the accident happened, you're riding illegally and you're not covered. If you're not sure, give us a call. You cannot insure against illegal activity. That also includes not wearing a helmet where it's compulsory (Cambodia, Thailand, Bali) and riding under the influence of drink or drugs (everywhere). If the shop lets you rent a bike without asking for your license, it doesn't mean you don't need one. Again, it's not their responsibility. It's yours to check local laws before you go. Don‘t be fooled, the insurer will check if you have a valid license (forging that international permit isn't looking so smart anymore). Wear protective clothing – long trousers and a jacket of sturdy material. Flip-flops, a t-shirt, and shorts don't count as sturdy. We know it's hard when it's stinking hot and humid in Thailand, you're just zipping back from the beach! Wear gloves - most people put out their hands to protect themselves in the event of a fall, even on a hard bitumen road approaching at 30mph (50 km/h). Ouch! Don't speed, drink or do drugs and ride. If you do end up in a crash, whether you are at fault or not, if you are a farang (visitor), the accident is your fault. Don't fight it, but negotiate to keep the costs down. Are the Thai police reliable and approachable? Can you bribe your way out of anything? Read these tips for staying on the right side of law enforcement. There are many ways to get around Thailand: Tuk Tuk, bus, motorbike, train, boat and others. Here's how to do it all safely and avoid being another statistic. Traveling in Thailand is no fun without money. Protect your cards against dodgy ATMs, ID swiping vendors, counterfeit currency and more with these tips.